So it has come to my attention (mostly from twitter profiles) that everyone has a website; there are a million blogs out there. But, I have also noticed that most people don't update them too frequently. Every few days, weekly, once a month, or sporadically whenever the mood strikes seem to be the norm. I, on the other hand, am closing in on 600 consecutive days of posting since my first entry in March of last year. 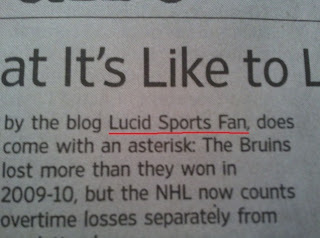 The fact that you can read new stuff here every single day is definitely one of the things that sets LucidSportsFan.com apart from the rest. 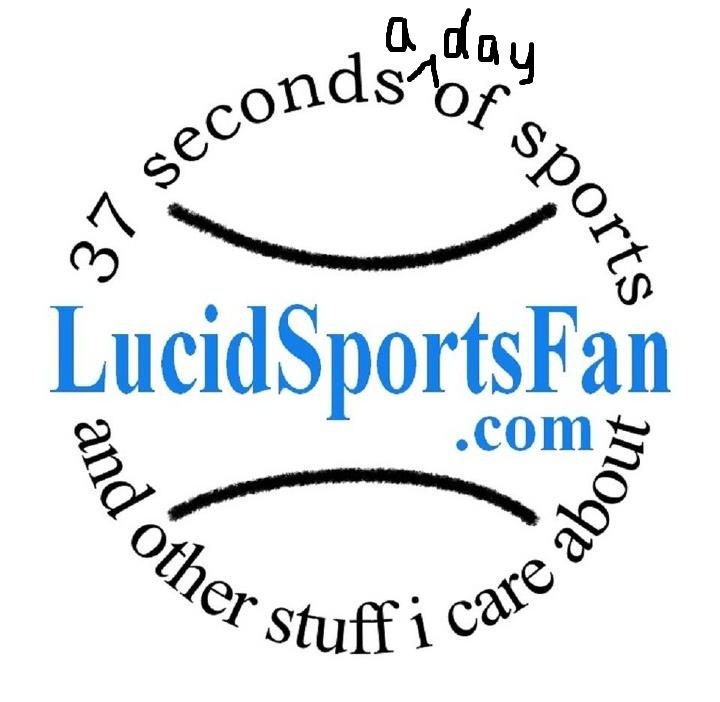 I'm wondering if the title should reflect that, and thinking of changing it to "37 seconds a day of sports and other stuff i care about." 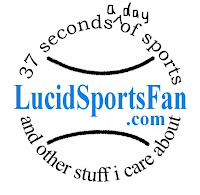 It would actually fit perfectly into the logo, the top is shorter than the bottom. I'm a little worried the title is already longer than it should be though. Plus it would mean I'd have to get new business cards again, but that's probably a good idea anyway since they don't have the logo on them. What do you think? Vote in the poll on the right. 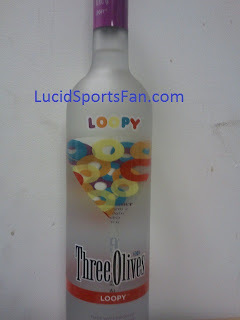 Fruit Loop Flavored Vodka. Seriously. The other night my bar was rented out for a private party, and the company brought in a bunch of donated liquor they asked us to use. One of the products was a flavor of Three Olives brand vodka called "Loopy." It tastes exactly like fruit loops. A year ago I wrote a piece about Jim Beam's Pucker vodkas marketed for kids, but I think this one takes the cake. Look at the font on the top of the bottle! If that doesn't scream out "toy store and Saturday morning cartoons" then I don't know what does. And speaking of "cake," that's the name of another variety available from Three Olives, which has become the Baskin Robbins of vodka companies by offering 22 flavors in all (although none of them actually taste like olives). The Return of the Tebometer? Was Sanchez bad enough yet for Tebow to get a chance? When the Jest Jets traded for Tim Tebow this off season, it got me fairly excited for the hilarity I believed would ensue. My standard answer when asked whether I though Tebow or Mark Sanchez would be the New York starting quarterback this year? "Both of them will probably lose the job more than once." Through two games, Tebow has yet to throw a pass. But Sanchez was bad last Sunday (10-27, 138 yards), and my guess is this weekend we will get to see the first poorly thrown ball of the season from Mr. Tebow. If this is the case, be sure to check back next week for the resurrection of the Tebometer, which currently stands at 47.3%. The Wall Street Journal is good at research. 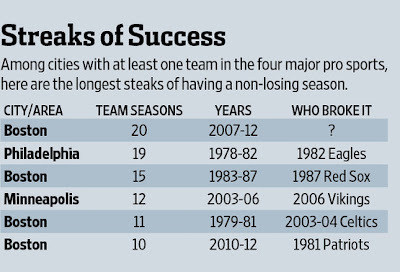 Back in March I did a piece about the four Boston sports teams having gone 20 consecutive seasons without a losing record. 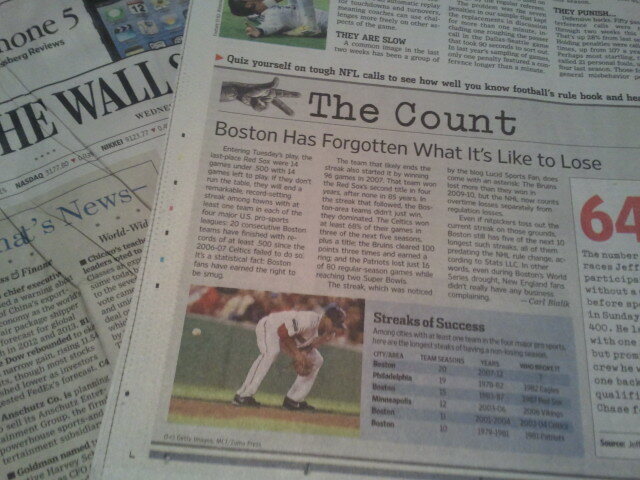 Two days ago I wrote that the Red Sox 81st loss of the year ended that streak (scroll down). 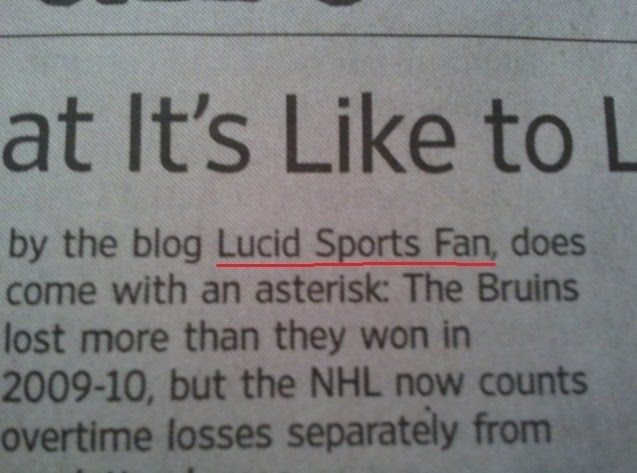 This morning The Wall Street Journal decided my story was worth mentioning. Seriously. They gave me credit. They were also kind enough to use their extensive resources and do the reseach I could not, confirming my theory that it is in fact the greatest run any four sport city has ever had. For the second week in a row, I'm going with a song called Stay, this time the much more mainstream edition. It hit big in 1994 off of the Reality Bites soundtrack, and I'm not the least bit ashamed to admit that even today I could sing along and get the lyrics 100% correct as I do it. I ran into Lisa Loeb at Chelsea Market in New York City (she was on a Food Network show that filmed there) a few years back, and she still looked exactly the same as she did over a decade earlier; glasses and all. Loss #81 is a BIG one. 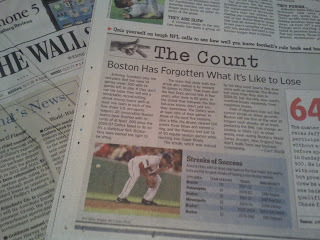 The Red Sox lost their 81st game game of the season yesterday, guaranteeing that they can not finish the year above .500. Click here to read my column for CLNS Radio about this and the upcoming Tampa series. As you may have heard, it'll be the first time since 1997 that the Sox haven't had a winning record. 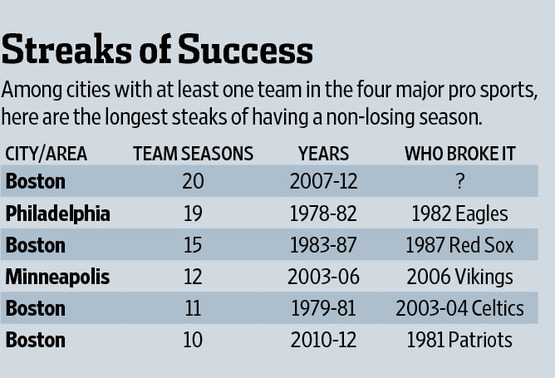 But what you are probably not aware of is the fact that it concludes an incredible streak of success by the four major Boston sports teams. 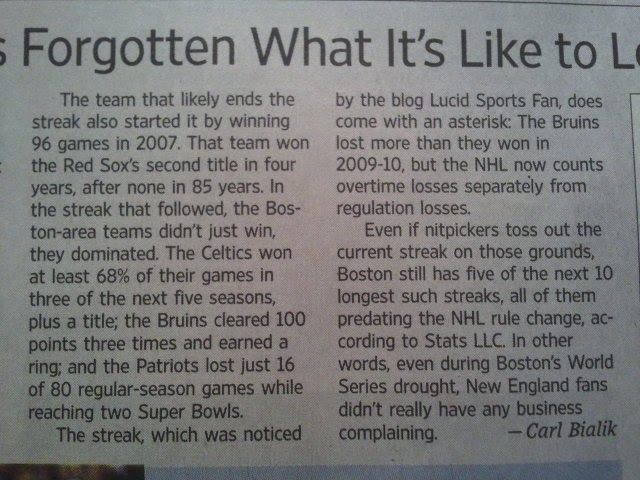 Between the Red Sox, Celtics, Patriots, and Bruins, the last club to have a losing record was the '06-'07 Celtics. 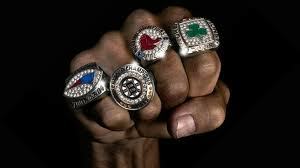 For twenty consecutive seasons every Boston team won more than they lost. Previously I calculated the odds of this to be in the neighborhood of 1,048,576 to 1. Have we just seen the greatest 5 years in sports history? But, what I need help with is trying to figure out if this is the greatest 5 year run any city has ever had. There are currently 11 other metropolitan areas with at least one team in each sport: Chicago, Dallas, Denver, Detroit, Miami, Minneapolis, New York, Philadelphia, Phoenix, San Francisco, and Washington, D.C. Based on my vast knowledge and detailed recollection of insignificant sports information, I feel confident in saying that no other city has had 20 straight winning seasons in recent memory. 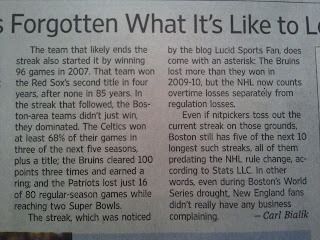 But was Boston's streak the longest ever of it's kind? At the moment I don't have the time or man power to research this, if you have any idea how to acquire such data please let me know. The fact that the Pats lost today is not the issue. If Stephen Gostkowski had hit that 42 yard field goal as time expired, everyone would be talking about what a great comeback it was, and how this team "finds a way to win." Instead we're looking at a startling upset. But, in the long run I doubt it's really going to make much of a difference. At 1-1 the Patriots are still in first place in their division (all 4 teams are 1-1), and the entire AFC has just three undefeated teams remaining. Not to mention that last year the Giants were only 9-7 (and the year before that the Packers 10-6) in the regular season before going on to win the Superbowl. So in reality I don't think the final outcome of today's game will end up being an issue down the road. Paris Lenon (Arizona #51) lived next door to me in college. 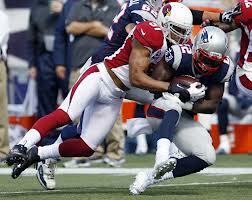 But, what does concern me is the Patriots lack of aggression on offense. This is a team that I expected to throw the ball all over the place and march up and down the field at will. Unfortunately they seem to have no confidence in their ability to do that. With 6 seconds to go in the first half they punted on 4th and 4 from the Arizona 47. What do you have to lose by going for it there? Later with 12 minutes to go and trailing by 11 they punted on 4th and 5 from the Cardinal's 43 yard line. If you want to win the game, that's a first down you have to go and get. And finally, after being handed the ball on the Arizona 30 yard line with a minute to go, the Pats were content to run out the clock and settle for the 42 yard field goal. I had a very bad feeling about this as it was happening. Gostkowski had already bailed them out from 46, 34, 51, and 53 yards; to expect him to do it again felt like tempting fate. Time and time again this game was sitting there for the taking, but New England's offense was reluctant to do so.